Have you tried oui yogurt yet? It's so delicious and unlike any yogurt I've ever had! Besides being creamy thick with a fresh fruit flavor, it comes in the cutest glass jars ever! And I've save every last one that I've gotten, too! I must have a trillion of them - just kidding. But I do have a lot! So when I saw the subject of the 8th Day of Christmas series, Christmas In a Jar, I knew I would be using these yogurt jars somehow! They are the perfect size for gift giving - especially to put mug cake mixes in! 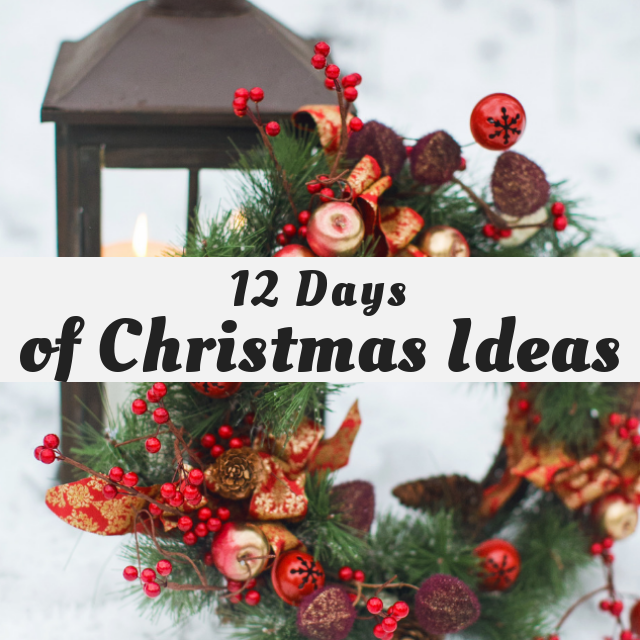 Christmas In A Jar Ideas! 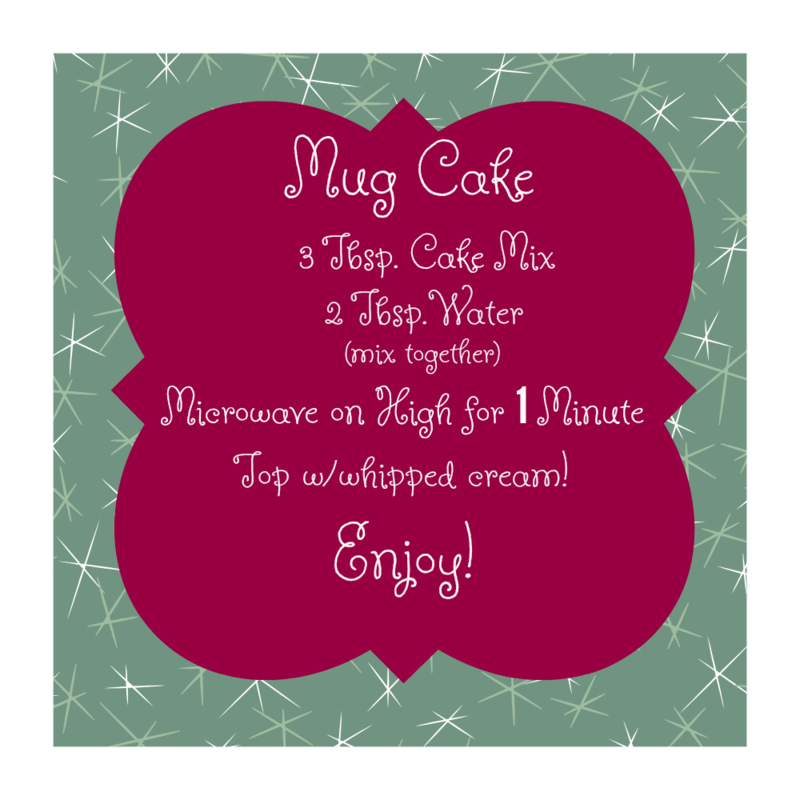 The ideal of a single serving dessert like mug cakes, makes for the best gift to give to so many for Christmas - co-workers, neighbors, teachers, caregivers - you name it! The perfect home-made gift - and it couldn't be any easier to make! First, let's turn the yogurt jar into a pretty container with a fabric closure. Make sure the clean jar is free of any oils or dirt by wiping down with alcohol using a paper towel. Next, to get the size of fabric needed, measure around the jar (circumference)and add 1/2" and then cut out the fabric. I got a 9"x 7" piece. Run a bead of glue around the jar just below the top edge and place the right side down of the fabric edge over the glue and smooth the fabric on around the jar. Overlap the end and seal with additional glue. The fabric should look like a tube. Next, pull the tube shape fabric up over the top of the jar, stopping just below the glued edge. Then run a bead of glue inside along the vertical edge to seal the fabric tube. You can then fold down inside and glue the top edge for a hem or border. Next, to make snowflakes or any type of holiday design on the jar, place stencils on the glass and . . .
dab the pattern with white paint and . . .
then quickly remove the stencils while the paint is wet. This is the cutest way to add a fabric closure to open jars! You can use a small rubber band to gather and secure before tying on a decorative bow ribbon. While the paint is drying on the glass, mix the two cakes mixes together really well! Insert a plastic bag into the jar. For each single serving, the recipe calls for 3 tablespoons of cake mix. I was able to place four servings or 12 tablespoons of cake mix into the jar. After filling, close the plastic bag with a twist tie. For an extra special touch, make tags with the recipe printed on to attach! I used PicMonkey for designing the tags. And finally, tie bow ribbon on the fabric top with an attached recipe label tag. Doesn't this mug cake look delicious? Especially if you top it with whipped cream! What a fabulous Christmas in a Jar ideal! What a fun gift idea and the packaging is absolutely darling. I love these! I love this idea! I've been saving those yogurt jars for our daughter to make gnome and fairy houses out of, but I'll have to keep some back so I can make these.